As a member of the Araceae (arum family), its common relatives include calla, anthurium, caladium, pothos, dieffenbachia and aglaonema. The origin of this species is unknown. 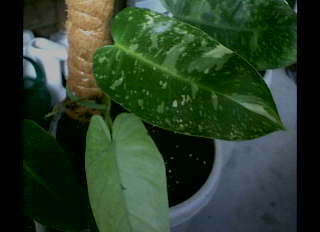 Stems climbing, leaves 12-24 inches, glossy bright green but there are variegated cultivars that are splashed with yellow, cream and acid green. While not noted for flowers, it does produce spathes up to 7 inches that are green externally while being deep pink-red within and having a green border. Chill sensitive, store at or above 55-60F. Philodendron: Greek for tree-loving, in reference to its native growing habit.